The workshop delegates’ eyes are starting to droop; the sweets are finished; the energy is flowing out the door and there are still 2 hours and 32 PowerPoint slides to go. A facilitator’s nightmare! What do cooking pasta and facilitating a training workshop have in common? According to clinical psychologist and facilitator Deon van Zyl, facilitating a training workshop is like cooking pasta. How do you know if pasta is cooked without tasting it? You throw a piece of pasta onto the ceiling. If it’s cooked it will stick on the ceiling. If not it will fall to the floor. As training programme facilitators we throw concepts and techniques (the pasta) at the learners (the ceiling) hoping as much as possible reaches them, makes sense, is remembered and acted upon (“cooked”). If we are unsuccessful the “pasta” will fall by the wayside and we have essentially wasted our own and the learners’ time - this is not good for reputations! This reminds me of an evening presentation I attended convened by a human resources association. I forget the topic of the address for reasons that you will shortly understand. The venue was a large auditorium which was almost full due to the reputation of the speaker as an expert in his field. Unfortunately he was a boring presenter and after 30 minutes people started to nod off. One man in the front row started to snore at first softly and then steadily louder. The snoring eventually so annoyed the speaker that he paused his presentation, and asked the man next to the snorer to wake him. The man quickly responded: “you put him to sleep so you can wake him”. To this the auditorium erupted in laughter which woke the snorer! With each new generation our learners are changing their approach to learning so we as facilitators must change our approach to training. We need to move away from the workshop anchored on multiple bullet-point PowerPoint slides presentation interspersed with a few group activities. “One day, as I was teaching internal combustion to a high school class, I noticed that the majority of students were either sleeping or talking to each other. I told them we were going to have a contest: Their job was to go out to the streets and bring me a carburetor from a parked car. When they came back, we took the carburetor apart. Part two of the exercise, of course, involved them putting the carburetor back into the car without getting caught by the police. 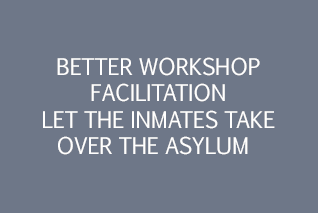 Anyone who has attended one of Thiagi’s workshops for trainers and facilitators hosted by us in South Africa will know that he is a firm believer in the “let the inmates take over the asylum” approach to training and performance improvement. The more the learners are actively involved in generating the programme content rather than being told it, the more they will retain. Thiagi recommends that instructional designers spend much less time designing content (i.e. the multiple bullet-pointed PowerPoint slides!) and more time designing activities. Let the inmates generate the content. We at Gateways firmly support and follow this approach to training programme design and facilitation. We know from firsthand experience including the positive feedback from our clients that it works. From “hard” to “soft” skills training – while the training methodology may be different the same principles apply. In these difficult economic times the training community is being pressurized to produce learning activities that are speedy, cost effective and work. This is all possible when the focus of facilitators and instructional designers is more on the process of learning through interactive activities rather than becoming content experts. Bring in the subject matter expert if and when needed but for the rest of the time let the learners generate the content – let the inmates take over the asylum.